This video shows installation of the 2019 AR-15 CompMag. The AR-15 CompMag has a new locking system. Due to the new locking insert, it will fit tighter in your magazine well when compared to a regular magazine. This is normal, it will require some force to install and remove it. 1. 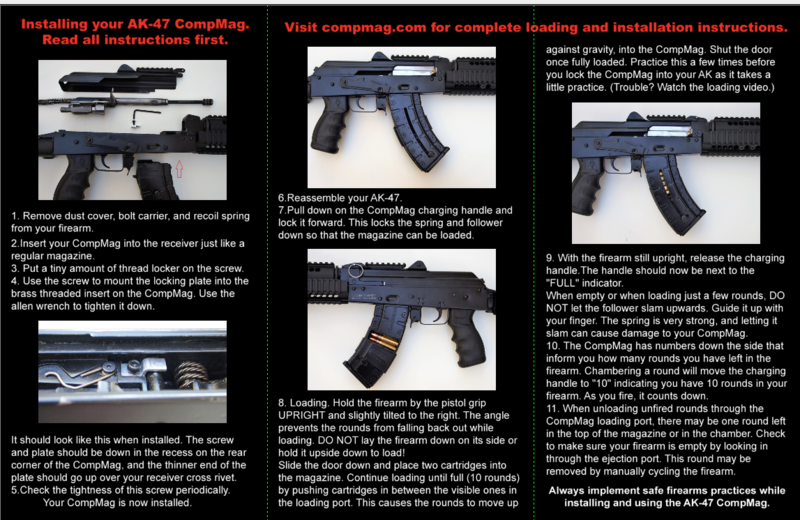 When Installing the CompMag you will only need to turn the screw clockwise 2-3 rotations. You will feel some light to medium resistance. You will not have to turn it very hard. Over-tightening of the locking screw will cause the rounds to rub inside the magazine when feeding. 2. Once you have tentioned the screw, make sure the magazine does not pull out while pressing the mag release. If it comes out, tighten the screw slightly and re-check it to make sure it does not come out. 3. Put one round in the CompMag loading opening and slowly slide the round up and down in the magazine using the charging handle. If the round does not hang up, you are done. If the round hangs up when bringing it down, loosen the screw slightly, then go back to step 2 of the installation notes (above). This video shows installation into a stamped receiver. For milled receivers you must purchase the milled receiver locking plate .This can be found under SHOP+, AK-47 CompMag Parts.